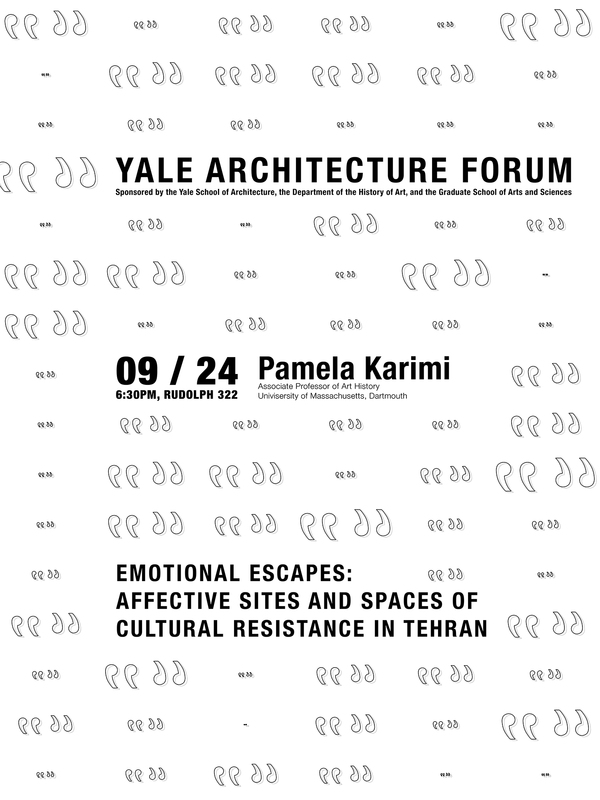 In this presentation, Professor Karimi will talk about the corporeal and visceral forces that have served to drive creative agents in Iran toward increasingly original forms of resistance that are played out across counter-institutions, escapist sites, underground scenes and other defiant spaces. Pamela Karimi is an associate professor of history of art and architecture at the University of Massachusetts Dartmouth. She is the author of Domesticity and Consumer Culture in Iran: Interior Revolutions of the Modern Era (Routledge, 2013) and co-editor of Images of the Child and Childhood in Modern Muslim Contexts (Duke, 2012), Reinventing the American Post-Industrial City (Sage, 2015) & The Destruction of Cultural Heritage in the Middle East: From Napoléon to ISIS (Aggregate Architectural History Collaborative, 2016). Karimi has lectured widely and most recently she contributed to Artefacts of the Future at ICA/Boston, TU Delft’s Global Petroleumscape project, Oslo Architecture Triennial and Chicago Architecture Biennial. Her major curatorial projects include “Black Spaces Matter: Exploring the Aesthetics and Architectonics of an Abolitionist Neighborhood” at the Boston Architectural College’s McCormick Gallery. She has held fellowships from the Iran Heritage Foundation at the School of Oriental and African Studies in London, American Council of Learned Societies, the Social Science Research Council, the American Association of University Women, and the Society of Architectural Historians. In 2018 she received the highest recognition for pedagogical achievements at the University of Massachusetts system, winning the Manning Prize for Excellence in Teaching. Co-founder of Aggregate Architectural History Collaborative, Karimi currently serves on the editorial and scholarly boards of Thresholds Journal (MIT Press) and the Association of Modern and Contemporary Art of the Arab World, Iran, and Turkey, respectively.